The water content in pharmaceuticals is extremely important to the finished product, please give an overview of how the water content impacts pharmaceutical product quality? Freeze drying is a long and expensive fill/finish operation that is required for many pharmaceutical and biotechnology products to ensure product stability, efficacy and long shelf life prior to distribution to patients. One of the key parameters affecting product quality is residual moisture (RM) content. The RM is typically lowered to a level that will no longer support chemical reactions (or biological growth). RM is lowered to control chemical and physical degradation processes. Although most drug products are dried to RM values of <1%, some of the new biotechnology products may require an intermediate RM value, 2-5%, to maximize product stability, safety and efficacy. Despite the importance of RM, there is currently no real-time monitor capable of determining RM throughout the secondary drying phase of lyophilization. What effect would too much, or too little water have on a finished pharmaceutical product? The effect of residual moisture on product stability has been studied for numerous products. In most cases lower levels of residual water improves stability and the manufacturer needs to balance increased drying times that result in lower water levels with a reduction in process efficiency and additional processing complications to achieve and maintain the extremely low levels of residual moisture. In some cases, lower levels of residual water can lead to a reduction in product stability, specifically for protein-based products and vaccines. It has been reported that a minimum level of residual water is required for conformational stability and over-drying can lead to a loss in product quality and stability. What does Physical Sciences Inc. offer to monitor and manage water removal? 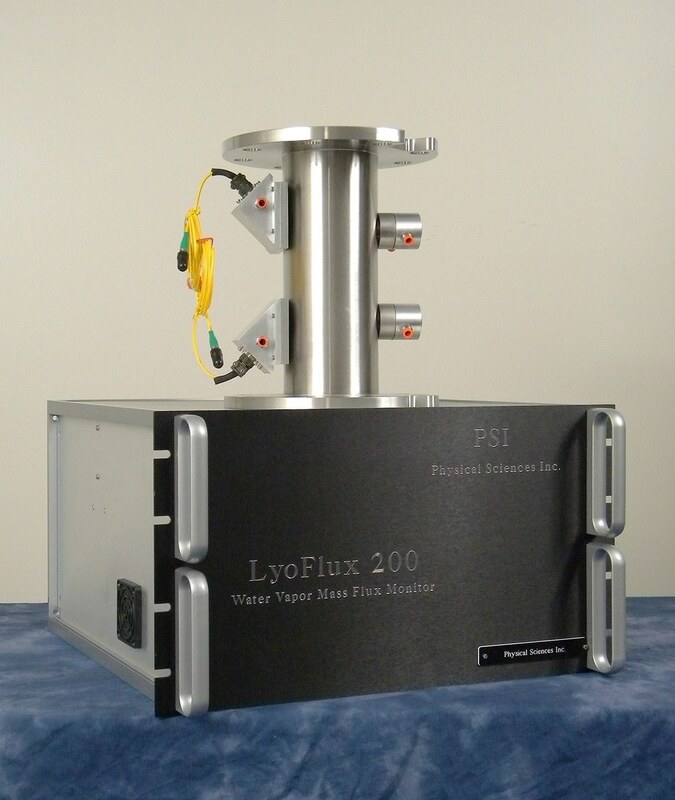 Physical Sciences Inc. has developed a Tunable Diode Laser Absorption Spectroscopy (TDLAS) based water vapor mass flow rate monitor, called the LyoFlux®, that provides continuous measurements of the water removal rate during pharmaceutical freeze-drying operations. The sensor uses a non-intrusive, near IR optical absorption technique to monitor the water vapor concentration and gas flow velocity in the duct connecting the lyophilizer product chamber and condenser. These measurements are used in combination with the duct cross-sectional area to calculate the instantaneous water vapor mass flow rate (grams/second) in the duct. These measurements can be integrated to provide a continuous, real-time determination of the total amount of water removed during the freeze-drying process. We note that the determination of product RM is a little harder to determine. The end user cannot simply subtract the integrated TDLAS measurements of water removed during freeze-drying from the total amount of water added to the batch of vials undergoing freeze-drying. This is because the total solid content of the formulations is typically in the 5% – 10% range. Measuring RM of the remaining solid following drying would require a measurement error of 0.05% – 0.1% for a product RM content of 1%. This is beyond the capability of the TDLAS sensor, and in fact most analytical instruments. In collaboration with the University of Connecticut, TDLAS-based determination of RM has been demonstrated based on correlating the TDLAS measured water vapor concentration at the end of primary drying to Karl Fisher based RM measurements. The development of the correlation curve for a specific product is performed once in a laboratory scale freeze-dryer and then has been used for subsequent laboratory and pilot scale experiments. This correlation curve essentially erases the measurement error accumulated during primary drying and enables accurate integration of the measurements during secondary drying to predict product RM throughout secondary drying with a useful measurement accuracy of +/-0.5%. What features does PSI offer to ensure a reliable freeze-drying process? The LyoFlux® sensor provides real-time data that can be used to efficiently develop and monitor freeze drying processes. Use of the sensor helps process engineers save time and money in developing their cycles and supports rapid disposition of product by production engineers following a process disruption. Many of the pharmaceutical industry end users have also demonstrated these measurements and additional applications of the technology, including the development of Quality by Design (QbD) knowledge and design spaces. Back in the late 1990’s and early 2000’s a couple of important papers were published that demonstrated that through the use of gravimetric determinations of mass flow and the well-accepted steady state model of heat and mass transfer of vial-based freeze-drying, a product, vial and dryer specific process design space could be calculated and graphically displayed that provided lyophilization process engineers with a comprehensive overview of the drying process. This approach calculated shelf and product temperature isotherms of the water vapor mass flow rate as a function of process pressure. When combined with the knowledge of the equipment capability limit, also displayed as mass flow as a function of process pressure, the graphical output provided a QbD based method of developing the lyophilization process design. In addition, the process engineer could predict how the product temperature would respond to possible process shocks in pressure and shelf temperature. The only problem with the gravimetric based approach was that the data required to calculate the knowledge and design spaces would require weeks to months to obtain. That is because gravimetric based experiments required for the data collection had to be run in steady state. These data were used to determine the key parameters including the pressure dependent values of Kv, the continuously changing value of Rp (as a function of dry layer thickness) and the pressure dependent equipment capability limits. Use of the TDLAS sensor to acquire the same data means that experiments no longer had to be run at a fixed set of conditions (e.g. pressure) and this shortened the data collection period to approximately 1-2 weeks. The use of the TDLAS sensor to develop the process design space will have the highest impact on pharmaceutical freeze-drying process development. The LyoFlux sensor from PSI are also available to be fitted into SP Scientific freeze-dryers, please give an overview of your partnership and how this collaboration helps both companies stay at the cutting edge of freeze-drying. PSI has had a relationship with SP Scientific from the initial experiments that demonstrated the feasibility of the TDLAS measurements in a Lyostar 2 freeze dryer back in 2004. During the past ~5-years, this relationship has been strengthened and is now producing product improvements and new products that directly benefit our pharmaceutical customers. This collaboration has enabled efficient application of the TDLAS technology to different scale lyophilizers, such as the miniature LyoCapsule and the larger LyoConstellation S20 pilot scale dryer. We have successfully demonstrated accurate mass flow measurements and importantly, accurate determinations of batch average product temperatures when the mass flow measurements were combined with the heat and mass transfer model of freeze drying. Thus, these tools enable more rapid process development and scale-up, ultimately allowing end users to streamline their processes and get their products to the market faster. A key improvement has been the development of software that allows direct communication between the freeze-dryer and the TDLAS sensor. This communication provides the sensor with continuous measurements of the freeze dryer product chamber pressure, shelf temperature and the product temperature data. The pressure and shelf temperature values provided to the sensor remove the need for user inputs to the sensor throughout the lyophilization process and allow truly autonomous operation of the sensor 24/7/365. This is a big benefit to the end user, saving time, resulting in fewer data collection errors and providing a single location for capturing and plotting the process data for subsequent analysis. Process recipes are input into the dryer and the user initiates the freeze-drying cycle, from this point the process runs without operator intervention to apply this technology. At the appropriate times in the process the dryer opens and closes the isolation valve to determine measurement offset values and initiates sensor integration of the mass flow measurements. The TDLAS sensor measurements and all of the resulting heat and mass transfer model data products calculated using the sensor and freeze dryer data are transferred to the lyophilizer control computer for storage using the dryer data historian. This ensures a common time stamp for all of the data and easier display and processing by the end user. The collaboration between SP Scientific and PSI keeps us both at the cutting edge of freeze-drying technology by allowing us to work together on research and development projects. The establishment of communication (and control) between the sensor and the freeze-dryer has also provided the foundation for more advanced applications of the sensor technology. PSI and SP Scientific recently completed a collaborative R&D effort that has created the TDLAS SMART Freeze Dryer technology. The TDLAS SMART FD enables the development of a freeze-drying cycle using a single experiment. It combines the existing Manometric Temperature Measurement (MTM) based SMART algorithm with TDLAS determinations of the water vapor mass flow to create a new product that overcomes the limitations of the original MTM based product. The SMART™ freeze drying technology automatically generates a freeze-drying cycle based on user inputs of product characteristics and vial dimensions, combined with non-intrusive TDLAS-based in-process product temperature measurements and a pseudo-steady state heat and mass transfer model of freeze drying in vials. This development enables the application of the SMART FD technology for a much wider range of product formulations, including high weight percentage amorphous biological products, on both laboratory and pilot scale freeze dryers, supporting both process development and scale-up. PSI and SP Scientific continue to explore additional applications and automation of cycle development with the ultimate goal of sensor-based cycle control. We recognize that automated cycle control will require many years of additional R&D and industry testing, but achievement of this goal is directly in-line with the FDA Process Analytical Technology (PAT) and Quality by Design (QbD) initiatives. What features support your customers in increasing their understanding and robustness of the routine freeze-drying process? The recent development and rollout of sensor and freeze dryer software packages enable direct communication and control between the sensor and the lyophilizer are important improvements for our customers. The communication (and control) capability significantly improves user application of the sensor technology, reducing the potential for end-user errors in applying the LyoFlux® sensor. The data sharing between the two systems also enables real-time and accurate calculation of the heat and mass transfer model data products and storage of the data on the freeze-dryer. Our goal is to eventually eliminate the sensor user interface, preparing the combined system for application in a manufacturing environment. This will provide end users with a rich library of data for each batch of the product that is freeze-dried. Currently these real time data sets provide process development scientists with the information needed to increase their understanding of the drying process, life cycle management, and enable development of robust processes using Quality by Design principles. In the future this data will be available to enable more rapid release of lyophilized product and more rapid disposition of product following process deviations. How does the TDLAS sensor integrate with other freeze dryer scales in the manufacturing process to ensure a smart approach to production and a reliable quality of the product? The LyoFlux® sensor is applicable to all size freeze dryers as long as we can insert an optical spool in between the freeze dryer product chamber and the condenser. PSI has demonstrated application on dryers ranging from the SP Scientific LyoCapsule® miniature, seven, 20mL vial lyophilizer, which has a 2-inch spool, up to a manufacturing scale lyophilizer which has a 30-inch diameter spool. The sensor control electronics, data acquisition and processing algorithm are common for all size dryers. A fiber optic and electronic signal umbilical cable connects the sensor control unit to the freeze dryer optical spool. A common optical platform is used for all spools, thus the only change with dryer scale is the size of the spool and the location of the optical ports. Because we are using absorption spectroscopy, longer absorption pathlengths associated with larger spools provide higher signal to noise ratios. To date our most common installation has been on the SP Scientific Lyostar 3 laboratory scale freeze-dryer, but we have fielded many recent inquiries for potential installations on larger dryers. We believe that this indicates a natural evolution of the product application from the laboratory to manufacturing scale. It may be occurring at this time due to widespread industrial knowledge of the technology and the numerous publications describing application of the sensor, including a publication by the FDA. Companies that adopt the LyoFlux® technology for monitoring their processes on all scale freeze dryers will have common data sets from development through scale-up to manufacturing. This should result in improved process understanding, likely faster time to market and more efficient assessment of product quality in the event of process disruptions. What’s next for Physical Sciences Inc? Physical Sciences Inc. continues to work with both our academic and industrial collaborators to develop next generation sensors, and to improve application of the TDLAS technology, with the eventual goal of using the LyoFlux® sensor and other PAT sensors for real-time process control. PSI is currently collaborating with university and industrial partners to apply the TDLAS technology and process models for improved lyophilization process development and scale-up. This includes the development of a new aseptic, pilot scale lyophilization facility to enable testing of new sensors and process development models in an environment that is representative of a manufacturing facility. This will support the pharmaceutical industry and the training of the next generation scientists and process engineers on lyophilization process development and scale-up. This facility, which is expected to come on-line in Fall 2019, will be available as a user facility to both academia and industry. In summary, we are still actively pursuing numerous R&D projects to advance the sensor and its application. Where can users find more information? Bill Kessler received his undergraduate and graduate degrees in chemistry from Boston University, performing ultra-high-resolution gas spectroscopy. His research focused upon multi-photon excitation of aligned ionic states. In 1986 Bill joined Physical Sciences Inc. in Andover, Massachusetts as a staff scientist. His work at PSI has spanned numerous disciplines including combustion, atmospheric, and chemical laser research. Bill’s focus shifted to the development of diode laser-based sensors and sensor networks which leveraged the tools created by the optical telecommunication industry for industrial sensor applications. In December 2000 Bill became a founding member of the PSI-spinout company, Confluent Photonics Corp., focused on developing high index contrast optical waveguides for optical telecommunications. Bill served as the Director of Applications Engineering while at CPC and its partner, the MIT Lincoln Laboratory, developed silicon-on-insulator waveguide tapers for efficient laser source coupling to single mode photonic circuits. He returned to PSI to pursue the development and application of advanced optical sensors for pharmaceutical process monitoring and control. Bill is now the Vice President of the Applied Optics business enterprise within PSI and is the technical lead for the tunable diode laser absorption spectroscopy based LyoFlux® product. He oversees two additional business units, the Biomedical Optics Technology and Aerothermal System groups.